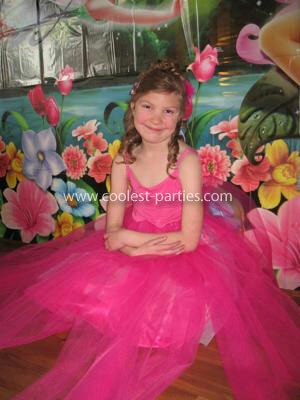 My daughter is very much a princess & the idea of a fairy princess party for her 8th bday was an easy decision to make! The 1st thing we had to decide on was the invitations. I designed & ordered my invitations online. They were pink & I had my daughter color a pic of a fairy princess which I then scanned into the computer & was able to add to her invite design. She was so proud to see her own colored pic as a part of her invite. On the front of the invitation I wrote the following verse: “Fairies fairies did you hear? Samantha’s bday is almost near! You’ll dance, you’ll eat, you’ll have sweet fun. You’ll be a fairy princess before it’s all done. 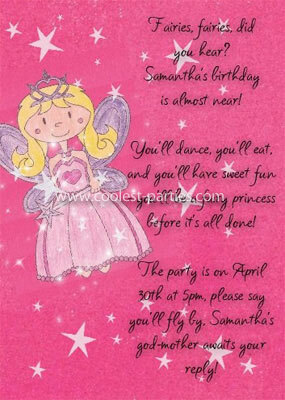 The party is on April 30th at 5pm, please say you’ll fly by, Samantha’s godmother awaits your reply.” Before we mailed all the invites out, we put iridescent confetti in the envelopes for a little extra magic. 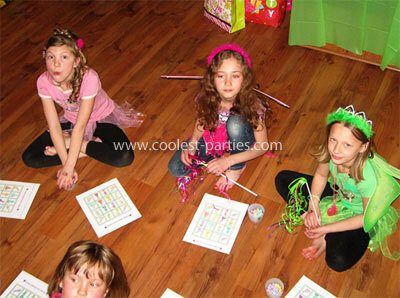 Decorations: Sam & I spent some rainy afternoons making large tissue paper flowers in pastel colors for her party. We hung these from the ceiling in the living room (which would be where the girls would eat, open gifts & sleep) with fishing line so they looked like they were floating. I bought some butterfly garden decorations on fishing line, in a few diff. sizes & colors & hung them from the ceiling so they looked like they were flying with the flowers! I took a green tablecloth & covered the TV & stand so it looked like a grassy hill & put my daughters Tinkerbell alarm clock/night light on it for the evening. The last main piece of decorating I did was to buy a wall mural from our local party store. 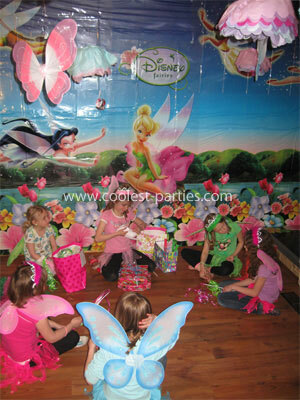 It was Tinkerbell & her friends & it covered the entire 1 wall of our living room & pulled the whole look together nicely. 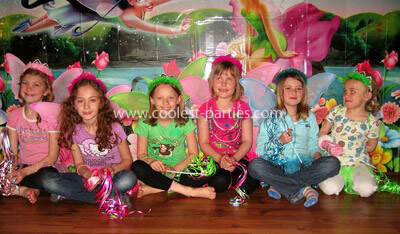 It also made a great background to take pics of the girls with Tinkerbell & her other fairy friends during the party! On of the things I knew I wanted to do was to actually turn them into fairy princesses with fairy outfits. I found a local online boutique where the lady sells all sorts of tutus, petticoats & other ballerina costume type items. The outfits came in variety of pastel colors so Sam asked each of her friends to pick what color they liked best & that is what I ordered. Also looking on this online boutique, I saw the cutest hot pink fairy princess dress which was only $29 so I bought that as a special outfit for Sam to wear during the beginning of her party! I could not wait to surprise her with it! With party day approaching it was time to think of some activities to keep the girls busy! I decided that each game they played in the 1st part of the evening was going to earn them a piece of their fairy outfit. 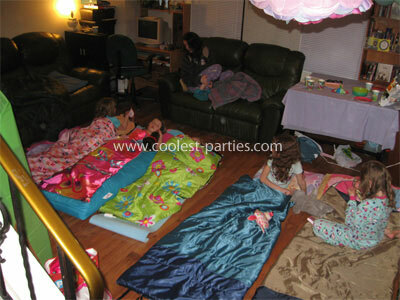 All of our activities were set up downstairs which was decorated with pastel colored balloons on the wall. I will outline all of the games we played in a little bit but let me tell you about the cake! 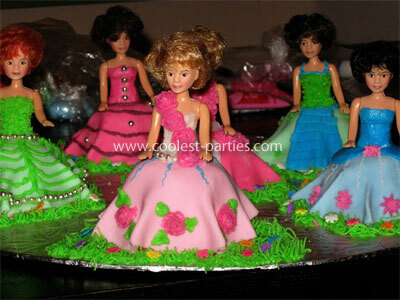 I wanted a cake that was cute & really special so I decided to make mini doll cakes for each girl, decorated in the same color that they had chosen for their fairy outfit. I had a friend help me decorate them & they turned out perfectly! It felt like forever but finally party day had arrived! I don’t think Sam (or mom for that matter!) had ever been as excited for 1 of her bday parties before! The afternoon of the party we surprised Sam with her dress & a trip to the hair dresser to have her hair done all fancy! She loved being fussed over! Once all the girls arrived we started eating our pizza & chips. I had bought cups, napkins & plates that matched the pastel color theme of the party & sprinkled the leftover iridescent confetti from the invitations onto the table. I had also made a special punch with “magic” ice cubes. They were made of grape juice, so as they melted the original light color of the punch changed. It was now time for games & activities! Our 1st game was a Fairy Walk. I had printed out pics online of Tinkerbell & her friends & taped them all to the floor. As I played music, the girls walked around the floor. When I stopped the music, whoever was standing on Tinkerbell got the 1st piece of their fairy outfit- the ribbon tutu. With the help of a friend I was able to make sure everyone won & received their skirt! The next game we played was “Who took Tinkerbell’s Ring?” I explained to them that fairies can be mischievous sometimes & that someone took Tinkerbell’s ring! I took a long piece of yarn & had all the girls stand in a circle holding the yarn to form a circle. Before tying the yarn to close the circle I slipped my wedding ring on it. We started with the bday girl being Tinkerbell & standing in the middle of the circle. She closed her eyes & as the music was playing the girls all passed the ring to one another by sliding it along the string, when the music stopped whoever had the ring held onto it & Tinkerbell had 3 guesses to figure out who had the ring. If Tinkerbell made a correct guess, she came out of the circle & received 2 rings & a bracelet in colors that matched her skirt. The person who had the ring became the new Tinkerbell until each girl had a chance at being Tinkerbell & receiving her rings & bracelet. The next game we played was “Stick the Heart On The Necklace”, which was a pre-made game I had picked up from the party store. This was just like your traditional Pin The Tail On The Donkey party game, but of course, done up in pink with hearts, necklaces & other girlie accessories pictured. The girls all did really well on this game & each received a curly ribbon wand. I told the girls that there was only 1 thing left that they needed before they were real true fairies – their WINGS! We had a special wing ceremony. 1 by 1 I asked each girl if they believed in fairies. They said yes, closed their eyes, clapped twice & spun around. With a wave of my magic wand & a magical word, they received their wings. They went over to my helper & they each chose a special fairy name. 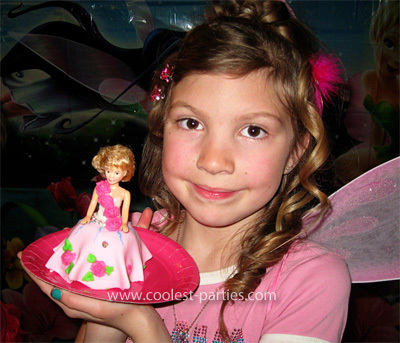 I had 2 little bowls set up & in each bowl was slips of paper with various fairy or magical sounding things on them. They picked 1 paper from each bowl which then formed their new fairy name. We had names such as “Twinkling Buttercup” & “Dancing Dewdrop” I then announced them all as real fairies, crowned them with their tiaras & my friend blew bubbles around all of them. We then took pics of all of them in front of the Tinkerbell backdrop. My daughter was really wanting to eat her cake & open presents by this time so that is what we did next. The kids were all impressed with their doll cakes & in fact some of them didn’t want to eat them & took them home instead! When we opened the gifts I had all the kids sit in a circle & gave my daughter a pop bottle to spin. Whoever it landed closest too was the gift that she opened next. With gifts & cake out of the way & mom getting a little tired I enlisted the help of my oldest daughter who had taken some ballet classes. She took the kids downstairs & taught them some ballet moves & they made up a little routine to “The Nutcracker” music & performed it for my husband, my friend & I while we videotaped it for them to watch later. After everyone was danced out we pulled out the nail polish we did all the girl’s finger & toe nails, complete with little jewels & put on special Tinkerbell & friend tattoos on their arms &/or hands. Next, the kids came upstairs into the decorated living room & we played Princess Bingo with game cards I had found online & printed off. We used pastel colored M&Ms as markers (& a snack!). The kids enjoyed this a lot more than I anticipated they would & we played many many rounds of it. We had planned to take the kids to the park once it got dark to play with some sparklers, but it was too cold for a walk to the park, so we played with the sparklers in the front yard. Everyone was chilly when they came back in so we set all the sleeping bags up & everyone climbed in while we watched the Barbie Movie “A Fairy Secret”. After the movie was over the other girls were up giggling & talking until I said it was time for some sleep – they fell asleep quite quickly after that. All had a great time & I had so much fun putting the whole party together! 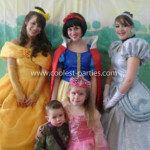 I have a real passion for making my kid’s parties as fun for them as I can & I hope you had as much fun reading about it as I did writing about it! 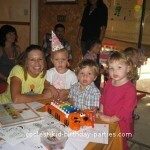 Kid party idea Posted by Creative P.